Among the workers in a rubber plantation in South India, ingestion of formic acid either accidentally or with suicidal intention is a common problem. Formic acid is diluted and used for coagulation of rubber latex. Easy availability makes formic acid a common poison. The aim of this article is to study the case of formic acid poisoning, its complications and management. Patient was managed symptomatically. Antidote was not used and no nasogastric aspiration was done. Patient had dysphagia; nutrition was maintained with open gastrostomy done on day 5 and subsequent enteral feeding. Measures to prevent anticipated complications were undertaken. Stricture of the esophagus is a common complication leading to long-term morbidity. After initial management, all patients should be on follow-up for prevention and management of strictures. Workers should be educated on complications of formic acid poisoning and easy availability should be curtailed by enforcing remedial measures. Growing rubber is the major agricultural activity in Kerala. Rubber plantation workers collect the latex from the trees by tapping, and then coagulate it by mixing with formic acid, which is further processed before sales. As formic acid is easily available to the rubber growing population both suicidal and accidental ingestion is commonly seen. Formic acid is also used in other industries such as paper, tanning electroplating, and manufacturing of disinfectants. This is a case study of one patient with accidental formic acid poisoning who was admitted in our hospital. A 39-year-old female patient presented to our A and E department with alleged history of accidental consumption of concentrated formic acid (85%). She had consumed approximately 20 ml of formic acid. On admission, she was complaining of throat pain, difficulty in swallowing and epigastric discomfort. There was no history of breathlessness, chest pain, or hoarseness of voice. On examination, patient was anxious, and vitals stable. Patient had Glasgow coma score of 15/15; pupils were bilaterally equal and reacting. Other systemic examination was normal. Her arterial blood gas study was normal. She was kept nil per orally, nasogastric tube was not inserted and stomach wash not given. Activated charcoal was not used. She was started on infusion of proton pump inhibitor and oral sucralfate 15 ml thrice daily. Intravenous (IV) fluids included 1000 ml of sodium chloride, 500 ml of 5% dextrose, and 500 ml of normal saline. Bladder catheterization was done and strict intake output chart was maintained. She was also prescribed amoxicillin and clavulanic acid injection 1.2 g IV twice daily empirically. Her pain was managed with injectable tramadol and oral lignocaine viscous solution. 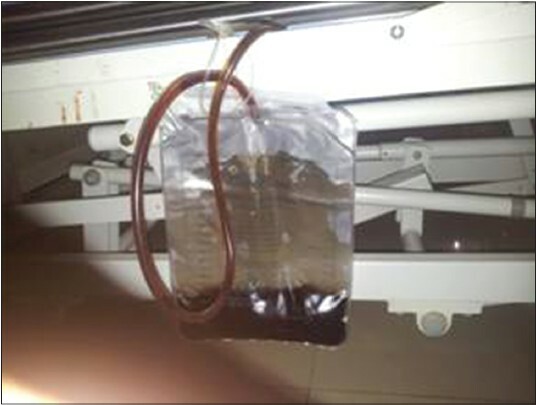 After 4 h, her urine bag showed dark colored urine suggesting of hemoglobinuria and intravascular hemolysis [Figure 1]. Her biochemistry also revealed lysed samples. She was started on diuretics furosemide 40 mg IV twice daily along with fluids. Subsequently, patient had two episodes of vomiting which were bloodstained and her throat pain worsened. By 1 st day, patient had complications such as hematemesis, hematuria, and hemoglobinuria. However, her bleeding time, clotting time, and prothrombin time was normal suggesting that hemolysis is related to the degree of acidity. Her total white blood cell (WBC) counts were 18,900 on day one with predominant polymorph nuclear lymphocytosis. On the 2 nd day, patient did not have any hematemesis, her hematuria improved and her coagulation profile was normal. Bilirubin and liver enzymes were raised. On the 3 rd day, her liver enzymes and bilirubin levels started improving. Multiple whitish patches were noticed in her oral cavity, which was managed symptomatically with local hygiene. On day 4, multiple ulcers were noted on the soft palate, buccal mucosa, base of tongue and right side of epiglottis [Figure 2]. Her WBC counts returned to 12,700 on day 4. With informed consent patient was taken for open gastrostomy on day 5 and enteral feeding started [Figure 3]. Patient was not started on any steroids. Patient was comfortable on day 4 and throat pain had reduced. She complained of mild dysphagia at the time of discharge. She was regularly followed-up for stricture formation and underwent regular esophagogastroduodenoscopy (OGD) at 4, 8, and 12 weeks. Patient was symptom free after 4 months. Fatal dose of formic acid is 15-200 ml. It is colorless liquid with the pungent odor and the majority of victims are males, with most cases of suicidal intent and minority cases, which are accidental. Long-term complications include esophageal stricture, for which reparative surgery should be done if required. Serial OGD should be performed during follow-up. Worker education on hazards of formic acid is important. In a patient with formic acid poisoning, gastrointestinal perforation, hematemesis, respiratory distress, hematuria are associated with increased mortality. Increasing age, pH < 7.3, and hematemesis are risk factors for increased morbidity. Metabolic acidosis can be corrected with administration of IV bicarbonate during initial few hours to reduce the associated morbidity and mortality. Esophageal stricture is the long-term complication, which may require serial dilatation. Workers of rubber plantation should be educated on safe handling of formic acid. Easy availability should be curtailed by enforcing remedial measures. Spreading the knowledge of side-effects of formic acid, both acute, and long-term is an important aspect of prevention. 1. Naik SM, Ravishankara S, Appaji MK, Goutham MK, Devi NP, Mushannavar AS, et al. Acute accidental formic acid poisoning: A common problem reported in rubber plantations in sullia. Int J Head Neck Surg 2012;3:101-10. 2. Dalus D, Mathew AJ, Somarajan Pillai S. Formic acid poisoning in a tertiary care center in South India: A 2-year retrospective analysis of clinical profile and predictors of mortality. J Emerg Med 2013;44:373-80. 3. Rajan N, Rahim R, Krishna Kumar S. Formic acid poisoning with suicidal intent: A report of 53 cases. Postgrad Med J 1985;61:35-6.3. 4. Naik RB, Stephens WP, Wilson DJ, Walker A, Lee HA. Ingestion of formic acid-containing agents - Report of three fatal cases. Postgrad Med J 1980;56:451-6. 5. Sujathan G, Jayapalan VK. Formic acid poisoning. J Indian Acad Forensic Med 1991;13:29-31. 6. Estrera A, Taylor W, Mills LJ, Platt MR. Corrosive burns of the esophagus and stomach: A recommendation for an aggressive surgical approach. Ann Thorac Surg 1986;41:276-83. 7. Moore DF, Bentley AM, Dawling S, Hoare AM, Henry JA. Folinic acid and enhanced renal elimination in formic acid intoxication. J Toxicol Clin Toxicol 1994;32:199-204. 8. Westphal F, Rochholz G, Ritz-Timme S, Bilzer N, Schütz HW, Kaatsch HJ. Fatal intoxication with a decalcifying agent containing formic acid. Int J Legal Med 2001;114:181-5. 9. Webb WR, Koutras P, Ecker RR, Sugg WL. An evaluation of steroids and antibiotics in caustic burns of the esophagus. Ann Thorac Surg 1970;9:95-102.